The cornea is the clear window at the front of your eye (parts of the eye). Directly behind it is the first section of the globe called the anterior segment. This compartment is divided into two chambers separated by the iris and filled by a liquid called the aqueous humor. Aqueous is constantly produced in the ciliary body, a radial structure in the posterior (back) chamber at the base of the iris. It then nourishes the crystalline lens as it flows across it, and exits through the pupil into the anterior (front) chamber. Increased intraocular pressure can be caused by an increase in output or a decrease in the outflow of aqueous humor. 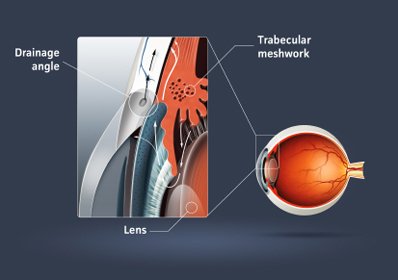 This fluid is then filtered through the trabecular meshwork and drains from the eye through a radial canal located in the angle formed by the front of the iris and the back of the cornea. With age, this angle narrows or the meshwork gets clogged with debris, slowing the outflow of aqueous. This triggers an increase in the pressure within the globe. Increasing intraocular pressure pushes the optic nerve fibers against the sides of the hole through which it exits the eyeball. 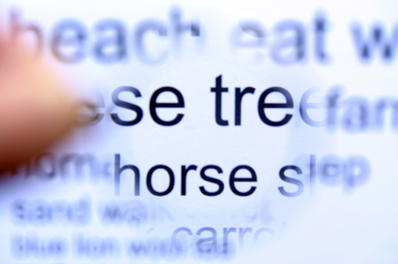 Glaucoma slowly affects the peripheral vision. By the time the patient realizes it this vision is permanently lost. Ultimately, this leads to a predictable pattern of peripheral vision loss. The patient is asymptomatic and can experience a significant and permanent loss of vision before they become aware of this condition.